The periodic inventory system journal entries below act as a quick reference, and set out the most commonly encountered situations when dealing with the double entry posting under a periodic inventory system. In each case the periodic inventory system journal entries show the debit and credit account together with a brief narrative. For a fuller explanation of journal entries, view our examples section. This reference guide is for the periodic inventory system, if the business is using a perpetual inventory system the journal entries are different and can be seen in our perpetual inventory system journal entries reference guide. 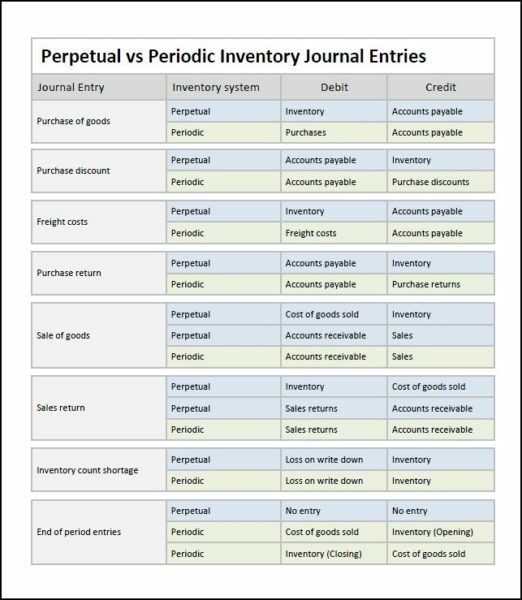 The periodic vs perpetual inventory system journal entries diagram used in this tutorial is available for download in PDF format by following the link below.